Yesterday I went for a walk with our preschool and the children and I harvested two plastic grocery bag's full of Miner's Lettuce (Claytonia perfoliata). While as I type this...much of the country is covered in snow...in my neck of the woods in California we have thriving greens ready to be enjoyed by those that know of their worth (my heart goes out to you who are stuck in a winter wonderland!!). Using scissors and our hands we snipped handfuls at a time. Care was taken to not pull them out by the root so that they will regrow. Our harvest was mixed with grass...hairy vetch (Vicia villosa)...and some oak leaves...so care had to be taken to ensure that we weren't eating anything else. After our sorting...I put maybe 3/4 of a cup of cranberry/raspberry juice into the blender...filled it to the brim with Miner's Lettuce...and added a couple of handfuls of frozen pitted plums. Blended...then added more Miner's Lettuce again. There really is no exact recipe...if you want it sweeter...add more frozen fruit...it's all up to you! 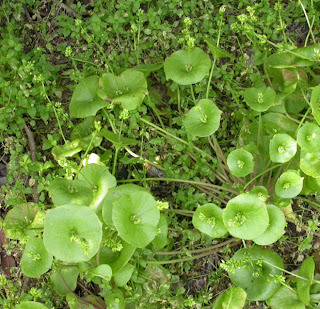 Here is some great info about Miner's Lettuce. The nutritional value...how to identify the plant...and harvesting ideas. This is actually the guy I got the idea to do the smoothie from! My daughter did a video of a portion of our adventure. You are walking into my home to see a slice of our lives!!! Oh...and pay no attention to my anti-green vegetable son! !